In the years immediately following World War II, leisure time became more prevalent, and a patio culture began to emerge. Ever since then, people have been throwing open their doors and getting back outside and enjoying the outdoors from the comfort of their backyards. However, in the past few years, landscape designers and homeowners alike have been moving beyond the basic patio or deck and have been building versatile, all-season outdoor living spaces. Who doesn’t want an outstanding outdoor living space? Here are some ideas of how to embrace one of the fastest growing trends in home design. Every outdoor space needs to have some sort of focal point for everyone to gather around. Everyone loves sitting around a fire, so a fireplace or fire pit makes a great start to a warm, natural gathering area. Keep it simple with one of our easy to install Tegula Garden Wall™ or Chateau Wall™ fire pits. Complete assembly, from dig-out to laying the cap, can be done in less than two hours. The resulting fire pit is great as a stand-alone item, or you can spice things up with one of our Rotundo circle systems. You can step it up a bit and use one of our Chateau Wall™ fireplace kits. Our fireplace kits come with everything you need to build them in a weekend. The optional wood boxes and their modularity with other Chateau Wall™ make our kits extremely versatile. Their grand size adds drama while anchoring any space without overpowering other elements, making it a perfect finishing piece. 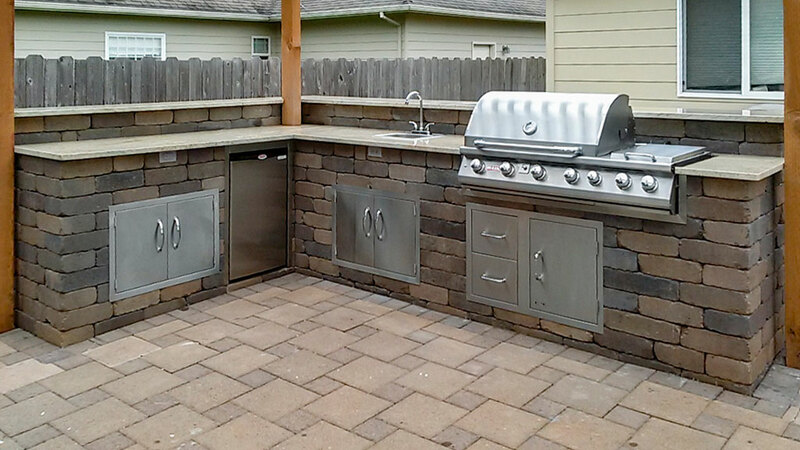 Everyone loves to grill, but what if you could cook and serve your entire meal outside? Our Chateau Wall™ blocks module with most available outdoor kitchen appliances and cabinets, enabling you to get the look and features you desire. Dine al fresco with your family and friends this summer, and enjoy food prepared only feet away! People will gather where there’s cooking, so expand your outdoor kitchen or living space with counters to provide plenty of room for people to sit and chat. Pair our Chateau Wall™ with a wood slab, stone or polished concrete countertop for a ruggedly good-looking social space. A counter can be a great place to hide outdoor appliances like a fridge or beverage cooler as well. No matter how nice it is or how much fun they’re having, no one likes to stand forever. Give your guests a place to rest and an excuse to stay, by building some sturdy benches using our versatile Chateau Wall™ blocks. A bench can be made completely out of Chateau Wall™, or you can mix textures and materials by using either a wood slab or dimensional lumber. The simplicity of a garden bench makes it a great way to add variety and versatility to your outdoor living area. 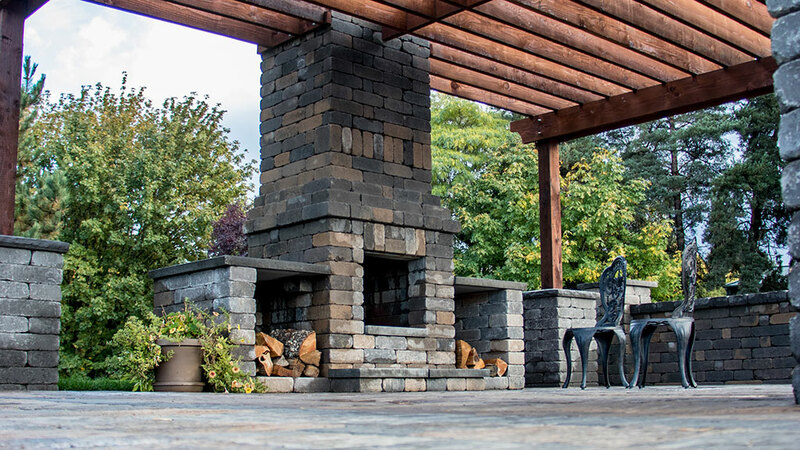 Regardless of how you decide to create your outdoor living space, one of Western Interlock’s experienced salespeople can help you to determine exactly what you need to end up with a space you love.